SuperBeets Review: Hype or Worth Using to Reach Your Goals? Bottom Line: SuperBeets packs the nutritional punch of eating several fresh whole beets. It has health benefits but isn’t necessarily going to help you reach your weight loss goals the same way a fat burner or appetite suppressant might. 2. History of the Brand: How Did SuperBeets Start? 7. How Does SuperBeets Work? 16. Would SuperBeets Work with Your Diet? 17. Verdict: Would I Recommend SuperBeets? Bottom Line: SuperBeets packs the nutritional punch of eating several fresh whole beets. It has health benefits but isn't necessarily going to help you reach your weight loss goals the same way a fat burner or appetite suppressant might. Available in both a capsule and a drink mix. Mixed results - some users swear by it. Others say it's useless. Complaints about the taste of the drink version. I personally hate the taste of beets. So, imagine my excitement when I decided to try SuperBeets. It’s a “nitric oxide superfood” which is supposed to have a number of health benefits, so it seemed worth it to me. Whatever I had to do to get the benefits of beets without having to eat them. Beyond my personal trial, I looked at the ingredients, the science behind them, the company that makes the supplement, and what other people who’ve used it had to say. What you see here is the result of my experience and research. You may be shocked by what I have to say. 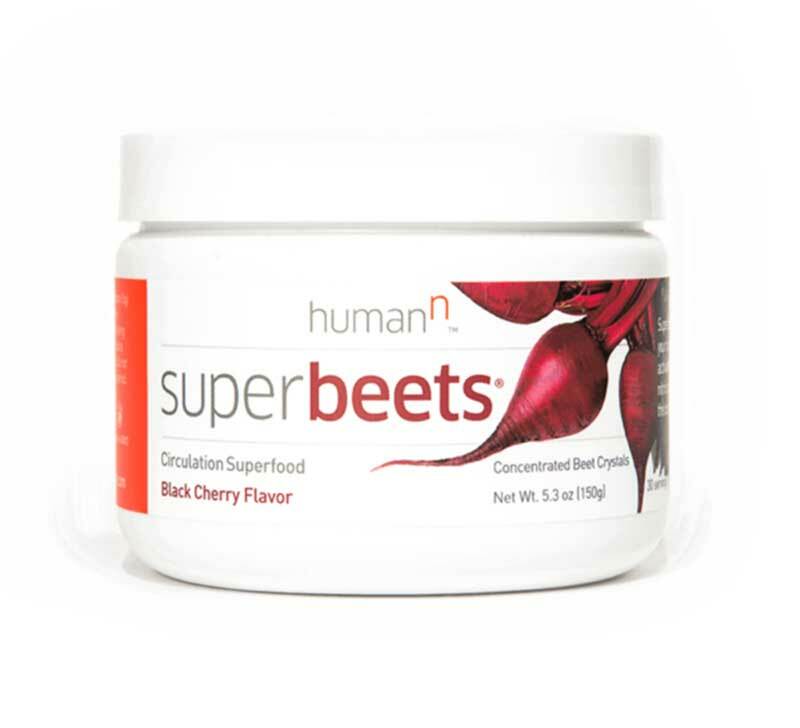 The official logo for HumanN, the company behind SuperBeets. If you’d like to try it for yourself, SuperBeets can be purchased through Amazon or using their Official Site. SuperBeets is a dietary supplement that’s made from beetroot powder. It promises more nutrients than other similar products, and even more nutrients compared to eating whole beets. It claims to boost the body’s natural nitric oxide production. Nitric oxide, also known as NO, is a gas that’s naturally made in the body. The body makes NO within the blood vessels, but you can also get it from foods rich in nitrates, like beets and green vegetables. SuperBeets is not a weight loss product, and there is no evidence to support the claim of increased muscle building. It also claims to help increase stamina and energy levels. SuperBeets came to the USA through Neogenis. That company later changed its name to HumanN. The company makes other beet supplements, such as BeetElite and Neo40. According to Manta, they are a private company based in Austin, Texas and they’ve been doing business for nine years. Beets are highly nutritious root vegetables, but many don’t like the earthy taste. I wasn’t able to find exactly where it is manufactured. Since the company is based in Austin, TX, it seems that it is likely manufactured there. SuperBeets is for anyone who wants to increase nitric oxide production in their body. This is good for improving blood pressure and circulation. The nitrates in beets help increase the body’s natural nitric oxide production. When you take a teaspoon of SuperBeets mixed with your drink, they say you are essentially eating three whole organic beets. One teaspoon is enough to provide the body with enough NO converted from the nitrates. Though there are no clinical trials to prove just how well the product works – or doesn’t work – but many reviews and testimonials show it does work to at least lower blood pressure levels and increase energy levels. There are a couple of studies that show beetroot powder can help supply the muscles with more oxygen so you can workout longer. I liked both flavors. I tried the original, which is flavored with apple, and the black cherry. I didn’t really prefer one or other. I just know I liked them better than actual beets. The natural sweetness of the apples and cherries helped to counteract the bitterness I hate about fresh beets. As with everything, you’ll find some people who love the taste, and others who hate it. Over my experience, I found a few reports of side effects, including bloating, gas, cramping, upset stomach, and nausea. It seems those side effects go away with continued use of the supplement. This appears to happen while your body is getting used to the change. You should not exceed the recommended dose of two teaspoons per day. Store the product away from direct light and moisture. Talk with your doctor before using this supplement if you are pregnant, nursing, taking any kind of prescription medication, have a health condition, or are under the age of 18. There are no lawsuits against the company. This is always a good thing. “First and foremost, a note on the taste: after skimming through the reviews, I see that the primary complaint about SuperBeets is the taste. For that reason, I am addressing this first. No, this product doesn’t taste like kool-aid, and if that is what you are expecting, you will be disappointed. There is no sugar in this product. It does have a hint of stevia to sweeten the taste, but again, I wouldn’t drink this stuff for the taste. I personally prefer the original to the black cherry, but I actually buy both and alternate between the two for the sake of variety. I recommend trying out both flavors. If you are drinking it for the health benefits (that’s the point, right?) and aren’t expecting a refreshing beverage, then you will be pleasantly surprised. In other words, when it comes to taste, it’s all about expectations. I don’t typically believe in taking many supplements, but since quitting coffee two months ago, I’d been on the hunt for an alternative to caffeine for an energy boost. That hunt ended when a friend recommended I check this product out. Wow! It works. I guess it shouldn’t be too surprising since I was already a believer in the benefits of beets and have previously gone through a juicing phase that involved many beets. Juicing is great, but also time-consuming. For that reason, It didn’t remain a part of my routine. This stuff makes it quick and easy to get that beet boost. It’s not hard to find research on the benefits of beets to your health. That said, my bigger concern was about finding a trustworthy company that stood behind their products, as I know that is definitely not the case with many (most?) of these supplement companies. SuperBeets is based in Austin, TX, and has an outstanding reputation. Their beets are grown in the USA, and their support team is helpful and easy to reach. If you’re going to try beets (you should! ), then you can rest comfortably that you are getting a quality product in SuperBeets.” – Chris L.
“I am disappointed with this product. I have tried other less expensive beet products from the health food store and achieved better results. I like the taste of beets so I had no issues with the taste. I noticed this product made my stools very dark which kind of freaked me out at first. After a few weeks of taking this product, I have noticed no extra energy or stamina. It would work with any diet, as it doesn’t contain any dairy, animal products, gluten, soy, or artificial sweeteners. If you’re trying to enhance your overall health, I would recommend this. If you’re trying to use this to lose weight or build more muscle, I don’t think I would recommend it. It’s good, and it worked well for me in terms of regulating blood pressure, but that’s it. There are a lot of promo codes available, like this one for 20 percent off, so you can at least save a bit of money if you decide to try it. SuperBeets can be purchased through Amazon or using their Official Site.